On Monday, I looked at how different spin rates for different pitches affect the way those pitches move through the air towards a batter. That post was useful for understanding the relationship between spin and velocity and movement. 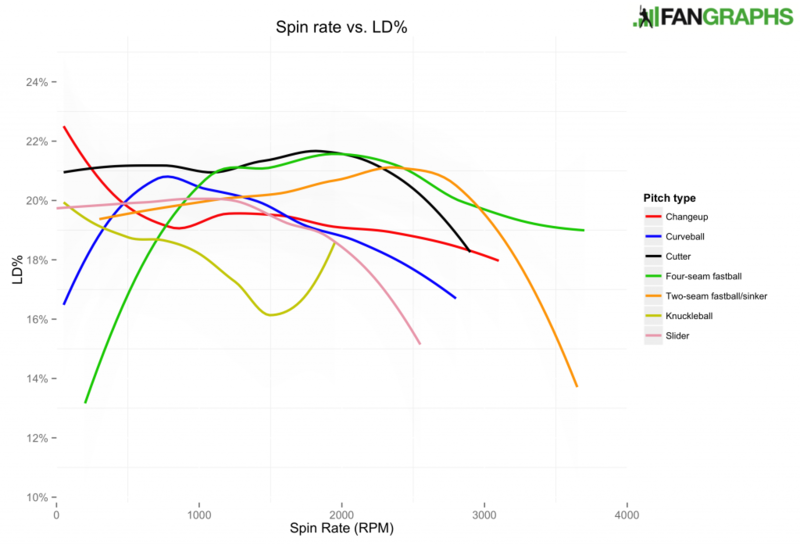 What it didn’t tell us, however, is too much about what the spin actually does for the pitcher: does more spin make pitches harder or easier to make contact with? Does more spin induce weaker contact? To answer those questions (as well as others), we can look at the actual production from hitters on these pitches. That’s the goal of this post. The first such stat we’ll consider is contact rate (Contact%), or times made contact (balls in play or foul balls) per swing. Unlike the graphs showing details about the flight path of the pitch, where the relationship was either constantly increasing or constantly decreasing the whole time for each pitch regardless of the measurement, there seems to be more of a parabolic shape here. (Except for knuckleballs. I don’t even know what’s going on there.) Contact rate is highest when the spin is neither very high nor very low, probably because abnormally fast- or slow-spinning pitches throw the hitter off-guard. 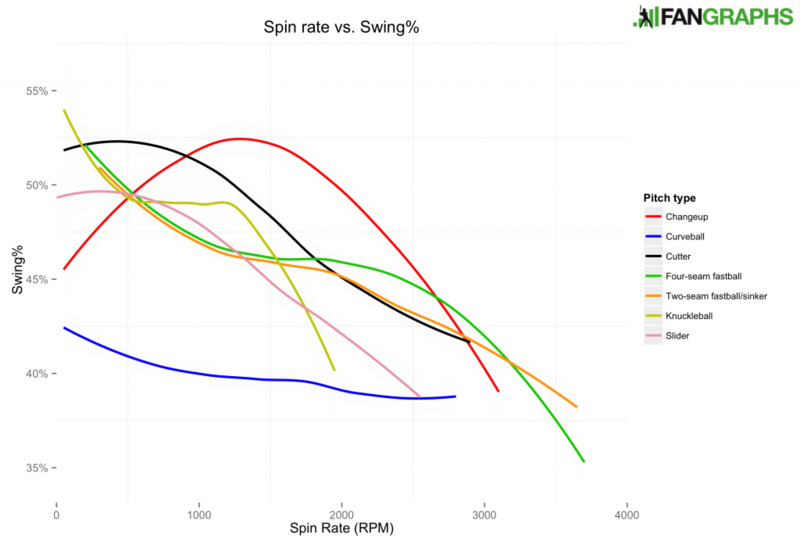 Other than changeups, for which the swing rate increases substantially before decreasing, there’s a very consistent negative relationship between spin rate and swing rate. My guess for why this is the case is hitters have a harder time telling what kind of pitch they’re being thrown when the spin is faster, so they swing less because they’re not totally sure what they’re swinging at. 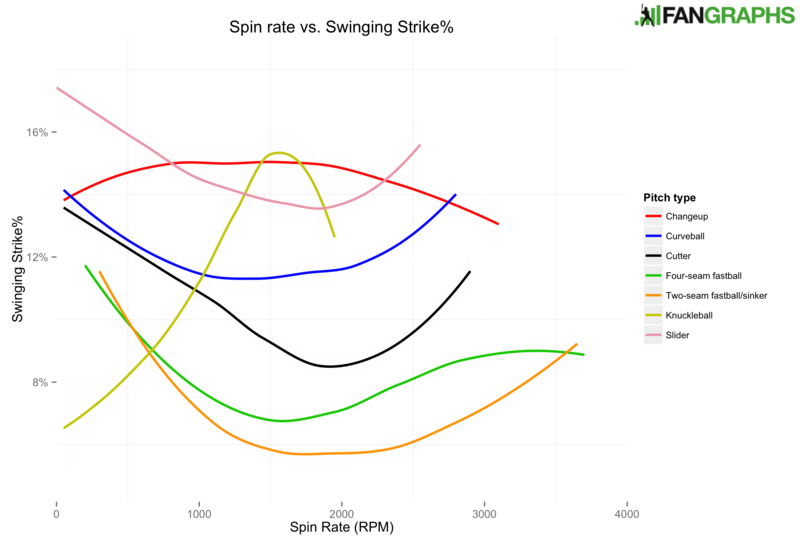 Let’s also look at swinging-strike rate (Swinging Stike%), which is the intersection of contact and swing rate. It’s the percentage of pitches at which a batter swung and missed, also calculated as (Swing%)*(1-Contact%). Pretty much what you would expect after looking at the previous two graphs. Throw your fastballs with lots of spin, I guess. 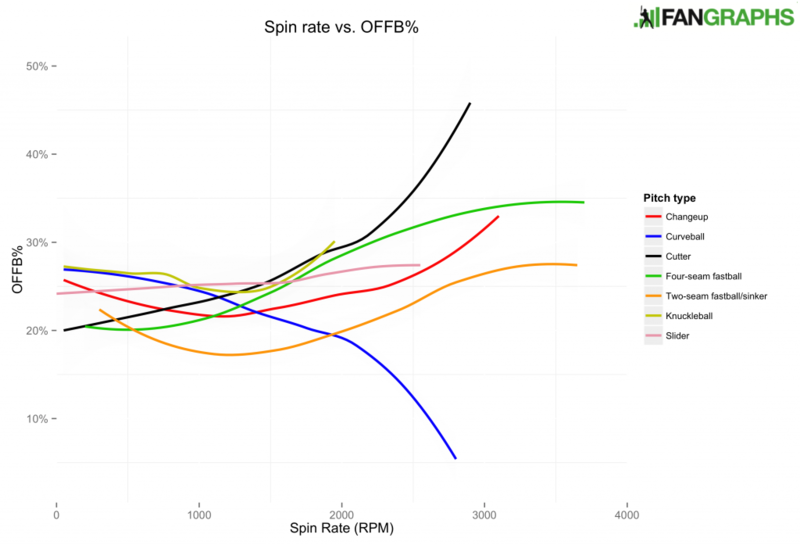 All three fastball types (two-seam, four-seam, and cut) see rises in swinging-strike rate as the spin rate reaches the high end. 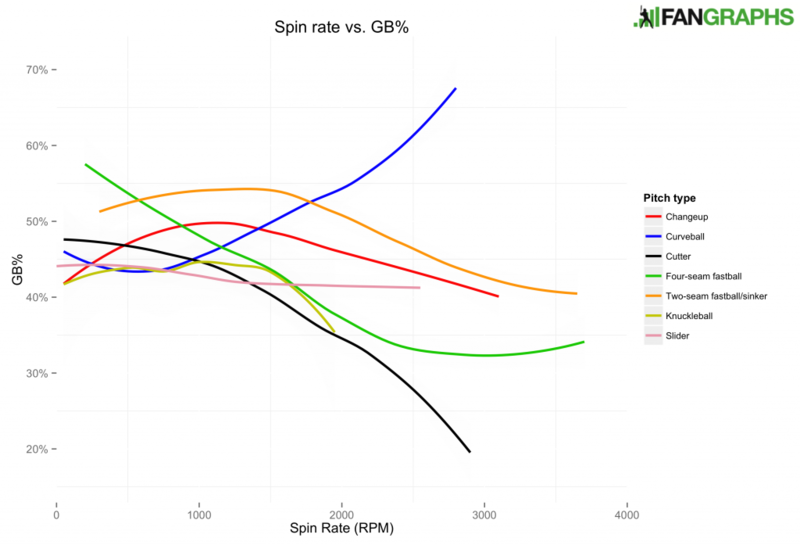 More spin means fewer ground balls (GB%), unless you’re talking about curveballs, in which case it means more. Remember how Collin McHugh was targeted by the Astros because his curveball spun a lot and induced more ground balls? Here’s proof of that in action. And, once again, this makes sense — a topspin-heavy pitch is harder to lift into the air, since its point of contact with the bat (which is usually moving upwards) is moving downwards; and a backspin-heavy pitch is easier to lift, since its point of contact with the bat is moving upwards. Not much of interest here. This is essentially the exact inverse of ground-ball rate. But, note, this is only outfield fly balls — we’ll come to pop ups soon. For now, what about line-drive rate (LD%)? Nope. There’s no real meaningful effect until you get way to the extremes, at which point there are so few pitches that there might as well not be that effect at all. Overall, it looks like there is a very slight downward trend, but nothing very significant. This is not surprising, as line-drive rate is extremely random and unstable. Pop ups are good for the pitcher, but the danger with balls in the air is that they can become home runs. Does the spin have any effect on that? 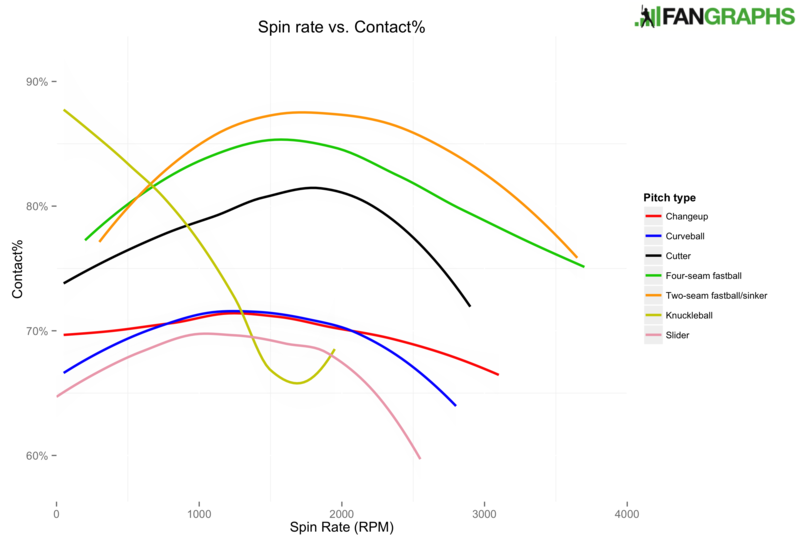 To put the previous five graphs together: how are batted balls affected by spin rate overall? To answer that question, let’s look at spin rate vs. BABIP and spin rate vs. wOBABIP, a stat I’ve mentioned before and which is just wOBA on batted balls. Since I’m covering multiple years with this, I used the Basic wOBA equation. Hmm… so maybe the spin rate doesn’t actually affect batted-ball production as much as it does batted-ball type. 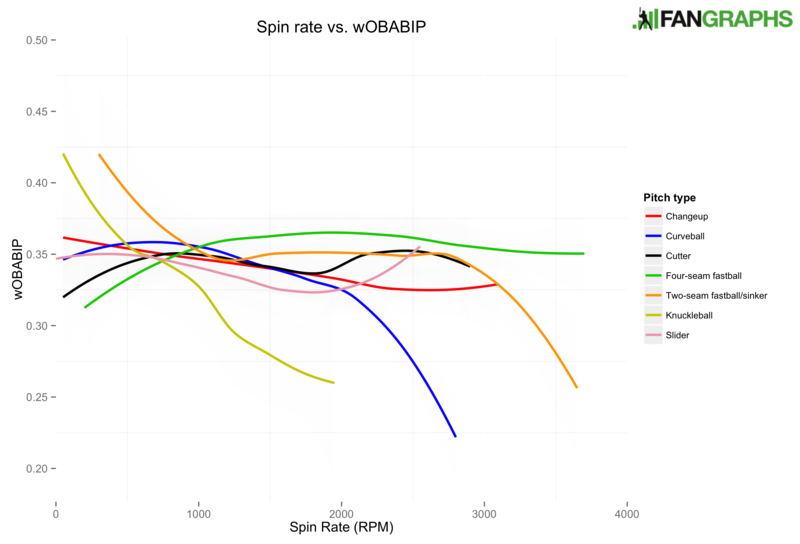 You can see a decrease in wOBABIP for two-seamers that spin at more than 3,000 RPM and curveballs that spin at over 2,000 RPM, but there aren’t so many data points at those values and that is, once again, probably just random variation. 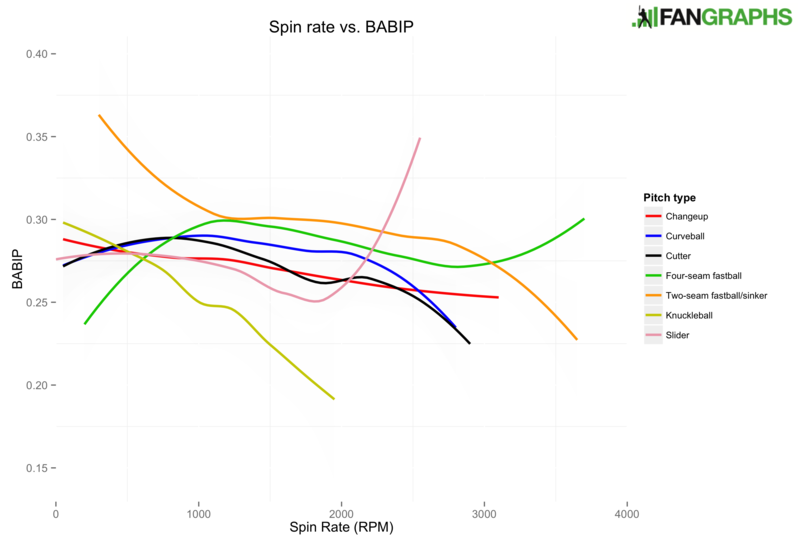 That’s unfortunate, since it looked for a little while like spin rate might give us a clue about which pitchers can keep a low BABIP and beat their peripherals. Even so, though, we now know more about the effects of spin on pitches. Similarly to my location article from last month, this isn’t anything that will break new ground in baseball analytics — it’s not super applicable — but it’s pretty cool. 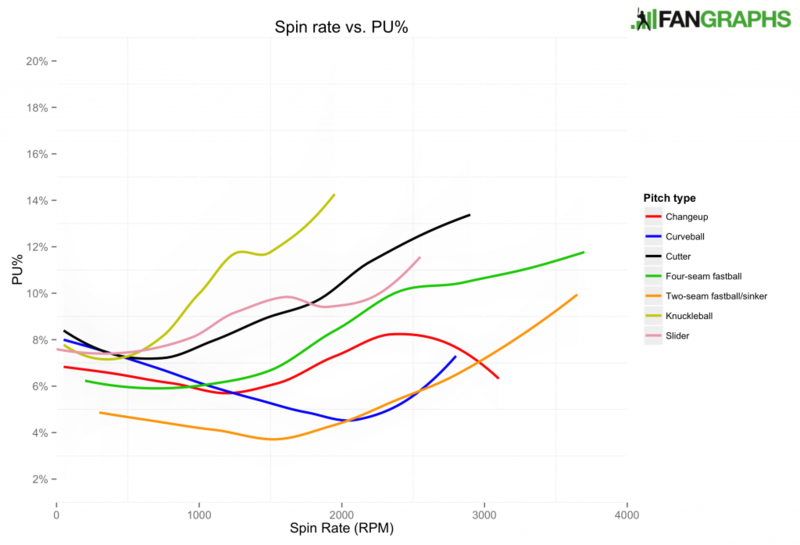 We hoped you liked reading On Rotation, Part 2: The Effects of Spin on Pitch Outcomes by Jonah Pemstein! How Strong Is Joc Pederson? While I do not doubt that it is easier to lift a ball with backspin than with topspin, I do not agree with the reason. The physics is actually wrong. To prove it to yourself, drop a spinning basketball onto the floor. Try both spin directions and see which way the ball bounces. It bounces in the opposite direction that the surface of the ball is moving when in contact with the floor. And the reason is very simple. If the surface of the ball moves in one direction, friction acts in the opposite direction, resulting in a bounce in the opposite direction. 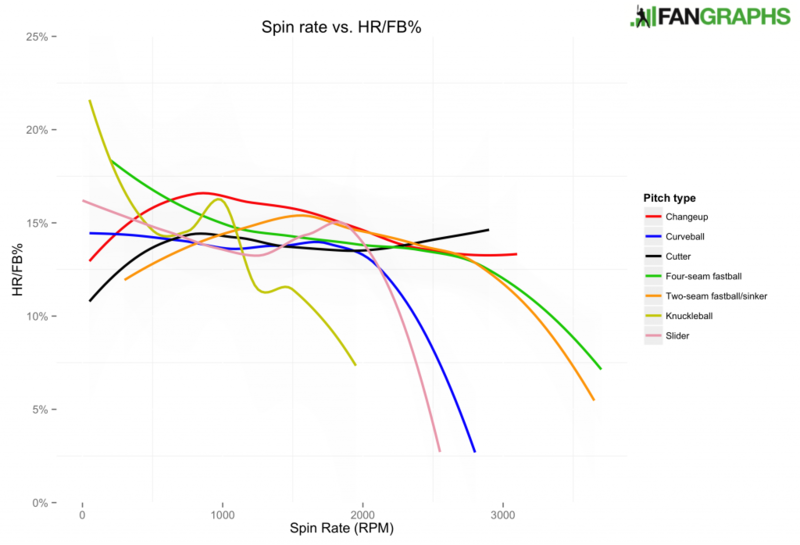 The most likely reason it is easier to lift a ball with backspin is that it is usually higher in the strike zone due to the lift that the backspin produces. The opposite is the case with topspin, when has downward movement, ending up lower in the strike zone and making it more difficult to lift. Please don’t interpret this post as a criticism of an otherwise fine article. I just want to make sure everyone gets the physics right. I think that makes a lot of sense, but I think that the friction on the surfaces of a baseball and a bat (slicker than a basketball and ground), and the speed at which both are traveling at the time of impact make the physics that you are referencing much less dramatic on the actual outcome of the angle of the hit. I tend to agree with the author’s comment about the angle the ball is moving affects the angle in which it is hit. Of course, my basketball example was only to illustrate the point. Real experiments with ball-bat collisions have been done that actually prove the point. There are many things that determine the launch angle of a batted ball, including the downward angle of the ball, the upward angle of the bat, the squareness of the collision, and the spin of the ball. My comment only applies to the effect of the spin, not to all the other things. So, if a ball is incident horizontally and the bat is swung horizontally and the collision is perfectly squared up (to keep all these factors fixed), then the ball will go down if the pitch has backspin and up if the ball has topspin. That is an experimental observation, which also happens to be completely in accord with the underlying physics that I described. Okay then yeah, I see what you mean at that point. Thanks for the explanation. Ah, much appreciated. You obviously know infinitely more about this than I do, so thank you! Through this though you have to remember that gravity plays a huge role here. The reason the ball falls without topspin is gravity. You can can negative vertical movement by throwing a changeup off from the side with sidespin to cause horizontal lift moving it horizontally and still getting your vertical movement from gravity. Your curveball is producing negative lift for bonus drop. Backspin holds the ball up.